Etcher and satirist Warrington Colescott is beloved for his artistic interventions into history. 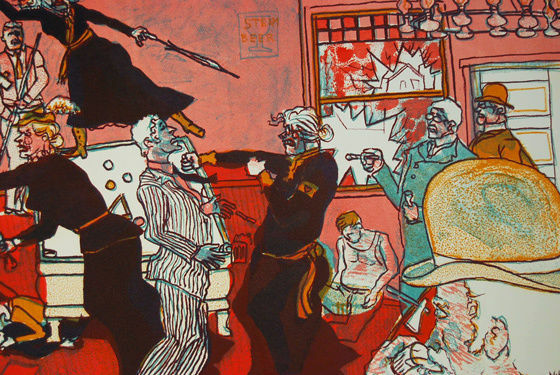 Whether re-writing the story of outlaw John Dillinger, revising the meeting of George Washington and Betsy Ross, imagining the setting for the Final Judgment, or re-casting the early days of New Orleans, Colescott brings a sharp eye, keen wit, and wonderfully subversive humor to his colorful etchings. Weaving fact and fiction, Colescott creates an alternative universe that is somehow more accurate than what you learned in history class.